Manchester City were crowned Premier League champions on Sunday when closest challengers Manchester United stumbled to a shock 1-0 defeat to West Brom. After two relatively low-key wins in their first three matches, this stunning demolition of Liverpool served as an early sign that City were a different proposition from the team that struggled to impose themselves the previous season. Liverpool were already trailing to Sergio Aguero’s predatory finish when the visitors had Sadio Mane sent off before half-time for a high challenge on Ederson. City made the most of their numerical advantage, adding a second before the break through Gabriel Jesus, who netted again after the interval. Leroy Sane struck twice late on to give City their biggest win over Liverpool since 1937 and hand Jurgen Klopp’s men their first defeat of the season. While City’s eye-catching style of play has had the purists purring, Pep Guardiola’s men also have a ruthless side that has served them well in their toughest tests. Facing champions Chelsea was a chance to send a message to their challengers and City were up to the task. They had scored 16 goals in their previous three league games but needed only one to move to the top of the table at Stamford Bridge. City were without Aguero, who had sustained a rib injury in a car crash, but Kevin De Bruyne made sure the Argentina striker wasn’t missed as he slammed in the winner in the 67th minute. De Bruyne’s long-range rocket foreshadowed a majestic campaign from the Belgian midfielder. Taking a giant step towards the title at the expense of Manchester United was a sweet moment for City, whose mature performance at Old Trafford was the season’s signature moment. 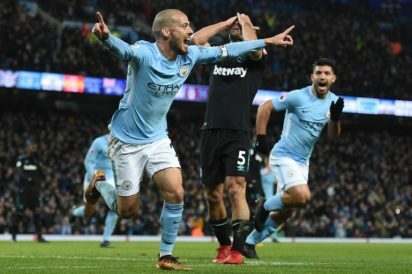 With United eight points adrift of the leaders before kick-off, City dominated from start to finish to leave their bitter rivals trailing in their wake. David Silva hooked home in the 42nd minute, only for United to level in first-half stoppage time through Marcus Rashford. City defender Nicolas Otamendi was the unlikely match-winner early in the second half. Guardiola’s side became the first team to win 14 successive English top-flight games in a single season, prompting United manager Jose Mourinho to concede the race was probably over before Christmas. After by a distance their worst week of the season as City blew the chance to seal the title on home soil against United and were dumped out of the Champions League quarter-finals 5-1 on aggregate by Liverpool, they showed why they are champions by bouncing back against Spurs at Wembley. Tottenham hadn’t lost in the Premier League since the sides last met in December, but in truth were lucky to escape without a much more severe beating. Jesus and a Ilkay Gundogan penalty put City deservedly 2-0 up inside half an hour. But having surrendered leads to United and Liverpool in the previous seven days, the visitors could have stumbled once more when Christian Eriksen brought Spurs back into the game before the break. Instead, City imposed their will again in the second period as Raheem Sterling grabbed a third and was still angry at himself for missing a host of other opportunities to make the scoreline even more convincing. The post Man City’s title triumph: 5 defining matches appeared first on Vanguard News.